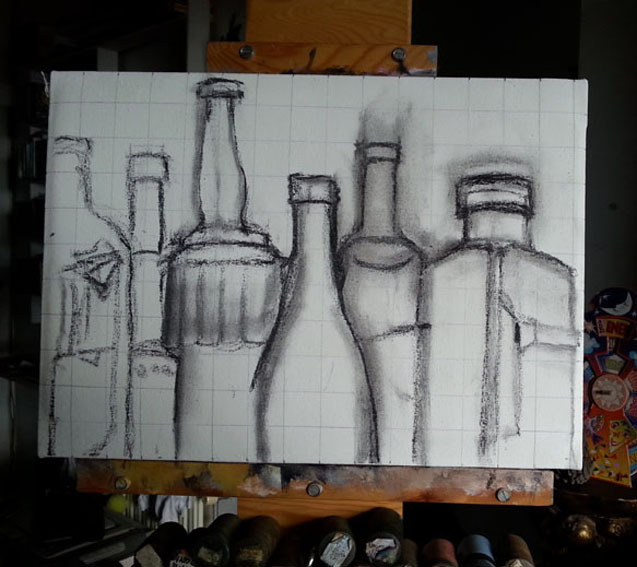 The Art Making Process of a Resin-oil Painting; a Spin-off from a Watercolor. Most painters work in more than one medium because variety offers many possibilities of expression. 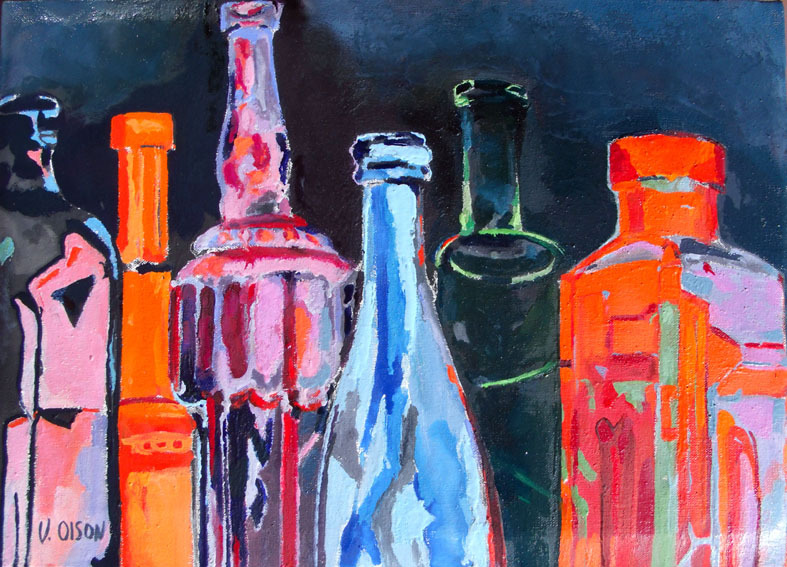 I made a spin-off of the watercolor ‘Glass Bottles on top of Antique Closet’ in resin-oil. Resin-oil is a medium in which you mix oil with with thickened linseed oil and Venetian turpentine. 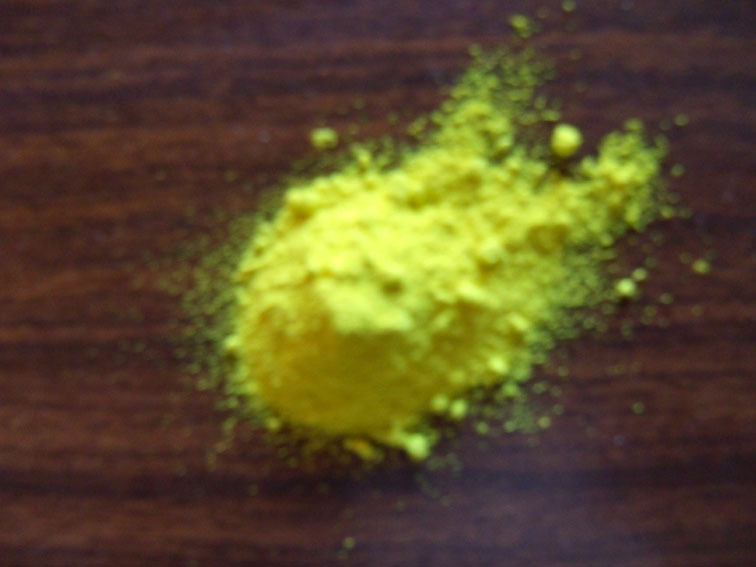 This medium gives a candied effect with vivid colors. 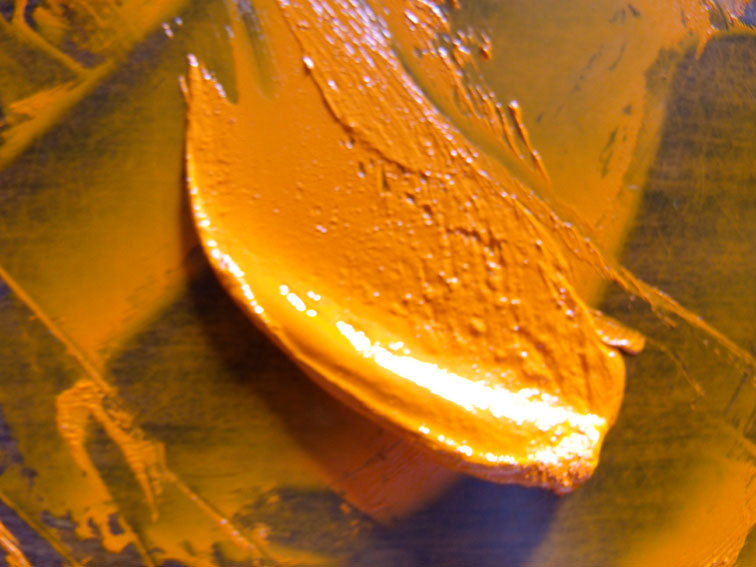 I use resin-oil in a more expressionistic manner than my watercolor and tempera paintings. I like the happy accidents and drips that show up on the canvas. There is one drawback regarding resin-oil; the room where you paint needs to have plenty of ventilation because the vapors are very strong. 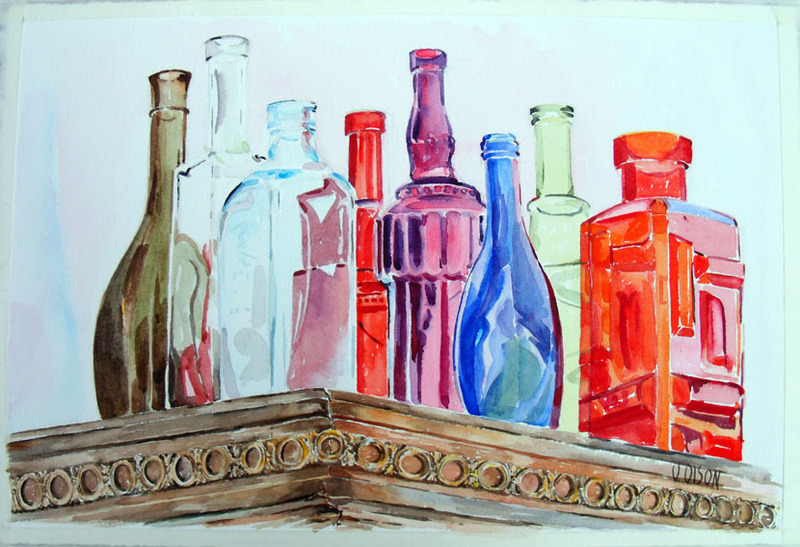 This is the watercolor ‘Glass Bottles on top of Antique Closet’. I chose this to make the resin-oil. 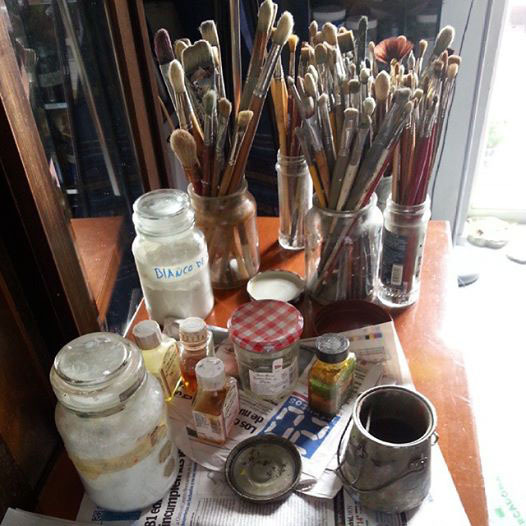 I use linseed oil, thickened linseed oil, Venetian turpentine, dry pigments and odorless petroleum spirits as part of my equipment. I mix dry pigment with linseed oil. When you mix the dry pigment with linseed oil with a spatula, the paint has to stand up like butter, not run down to meet the surface. 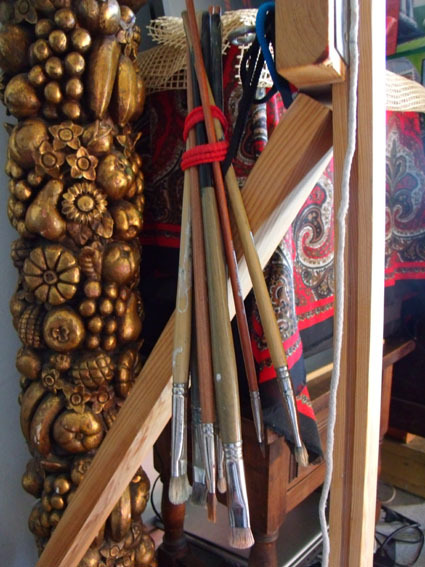 When you finish your painting session, clean your brushes with petroleum spirit, wash them carefully with warm water and soap and hang them upside down to dry. I don’t always begin with a drawing, but since I’m making a copy of my watercolor in a different meduim, I want to control the out come. I always try to work all around the picture plane, developing everything at the same time in order to find harmony. I’m still working all around the picture plane, putting down the exact color I see in an area and leaving it there without smudging it around the canvas. 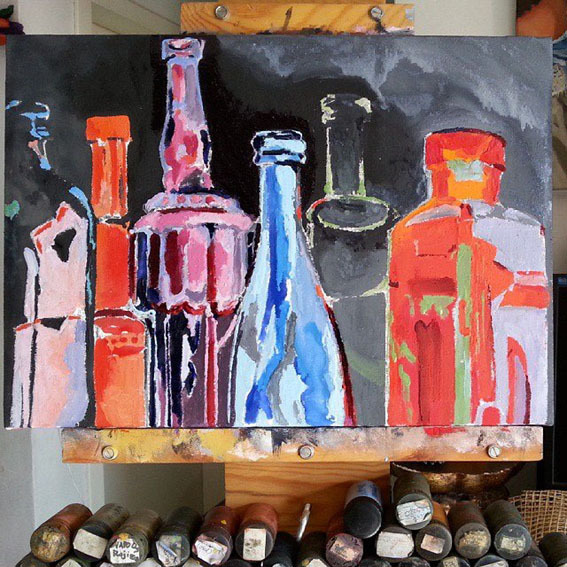 The dry pigments are on the easel in little plastic containers. This is the final result of the resin-oil on canvas. 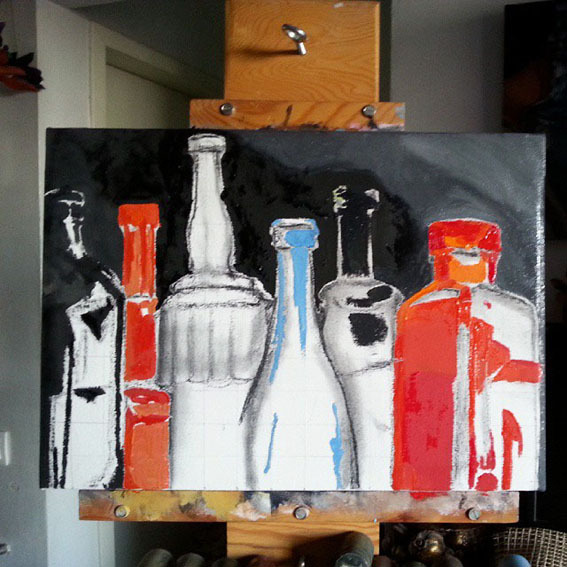 This entry was posted in Resin-oil and tagged Glass Bottles, painting tips, Resin-oil, watercolor. Bookmark the permalink.